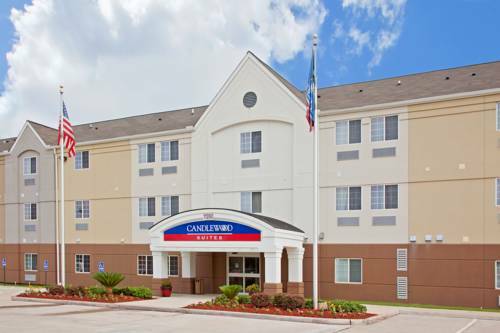 Welcome to the Candlewood Suites Westchase-Westheimer.At the Candlewood Suites Westchase-Westheimer your complete satisfaction is our number one priority! Our Houston, Texas extended stay hotel is centrally located in the Westchase District, near many of Houstons top oil and gas and engineering companies, as well as many other global, national and local companies. Among these are Phillips 66,Halliburton, Schlumberger, WesternGeco, Honeywell, BP, Quest Diagnostics, and many more.Our superb complimentary services include High-Speed Wireless Internet access, Laundry Facilities, on-site Fitness Facility, DVD Lending Library, Business Center, Meeting Room, an Outdoor Pool/Jacuzzi, an outdoor Gazebo with Barbeque Grills, and a weekly Guest Meet & Greet Social where we provide dinner and beverages for you!Visit our Candlewood Cupboard where you can shop for your favorite food and drink items on our Honor System and at your convenience! After a long day at work or play, you will enjoy a peaceful nights rest with our Comforts of Home bedding collection.Whether you are here for business or pleasure, our goal at Candlewood Suites Beltway 8/Westheimer is to make sure you come back to us each time you visit Houston! So make your reservation today and let our friendly and professional staff help you experience your home away from home! Elegant meeting room for small groups and meetings. With 700 sq. ft. it will comfortably accommodate 40-45 people classroom style, approximately 80 people with theater style seating. It has two 37" flat screen TV's and complimentary wireless internet. nd cNRG Stadium is home to both the Houston Texans and the world-famous Houston Livestock Show and Rodeo. NRG Center offers 1.4 million square feet of exhibit and meeting space, as well as, being fully wired to accommodate networking needs of our clients. BBVA Compass Stadium is an American soccer-specific stadium located in Houston, Texas that is home to the Houston Dynamo, a Major League Soccer club, the Houston Dash of the National Women's Soccer League, and to Texas Southern Tigers football..